A new place of interest and a nice place to visit is the newly transformed PTA Grounds, also known before as the Palaruang Lungsod, now called the People's Park. It is beside the Apo View Hotel (on the Palma Gil Street side) and in the midst of public elementary schools. 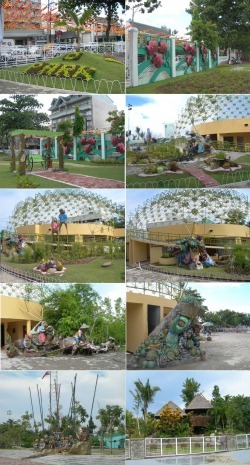 It is a nice place for the young and their elders, but especially for children, as there are giant sculptures of children done by Davaowenyo Kublai, and typically Davaowenyo features - the Philippine Eagle, the durian and other fruits, the waling-waling and other flowers. These are some pictures taken inside the park. You will be impressed with the sculptures and the refreshing landscape and the general neatness of the new People's Park. It is recommended that you and your family visit the People's Park and feel proud to be a Davaowenyo. Admission is free. 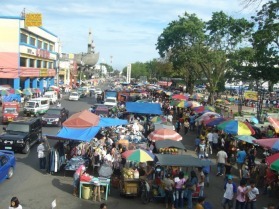 Anda Street Davao City St.
Victoria Plaza Carpark, JP Laurel Ave.